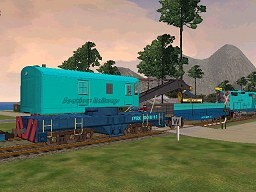 The original Seaview rolling stock package. 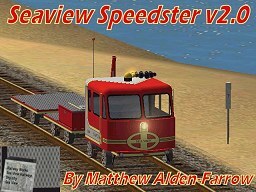 v2.1 is the root version of all Seaview Express models, and the only standalone pack. The Raildriver update brings it up to v2.2. Remember to install the v3.0 update below to have the latest model. Please note that the original v1/v1.1 Seaview Express models are no longer available, and are not required to run any models from v2.1 on up. 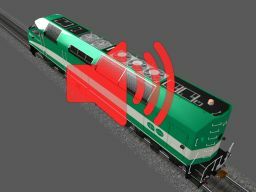 v3.0 update adds visible interior views to all seven models included in the MegaPak, animated doors for MSTSbin users, and revised cab signaling by Gary Cameron. Two LOD's used on exterior shape models to assist framerates. 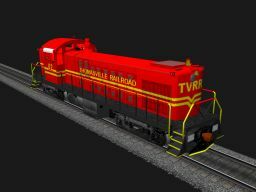 v3.0 update adds visible interior views to all four models included in the Expander Pack, animated doors for MSTSbin users, and revised cab signaling by Gary Cameron. All-new Seaview Express 4-pack adds new trainsets for the SV5 islands. All models in the Expander Pack II are built to the standards of the new Seaview Express v3.0 model. As with the previous editions, an optional Raildriver-enabled .ENG file is provided for each individual model in the Raildriver_ENG folders of each respective Express. Cab and sounds are aliased to the original Express MegaPak package. Be sure you install this beforehand, along with the v3.0 update to the shape files. "Surprise" Coconut City car - use CTRL+7 to find out more. The addons listed here are not supported by KLW TrainSim. Problems, questions, or comments about the releases listed below must be addressed to the respective author of the addon. The author(s) of the following addons are unaffiliated with Mattel or HIT Entertainment PLC. Thomas & Friends, related characters, elements and trademarks all remain the lawful property of their respective owners. No monetary gain is being made on any of the models or content contained herein. Thomas The Tank Engine, #1 This package includes a completely new Thomas model based on work by Kerry McCoy, with additional modeling by KLW TrainSim. The new model features accurate dimensions to the TV series model and a 3D face. 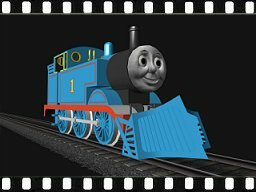 Included is Thomas' whistle sound, and a Thomas-specific cabview by James Tuvell. No headcode, engine running light headcode, express freight headcode, general goods headcode, and passenger headcode. Built specifically to Series 1/2 specs. 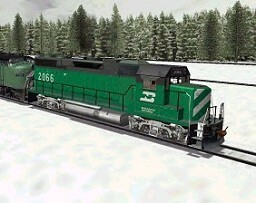 Addon: Snowplough for Thomas Add-on FreightAnim snowplow for the Kerry McCoy/KLW Train-Sim Thomas model. Requires previous installation of full Thomas model (klwthom.zip) above. 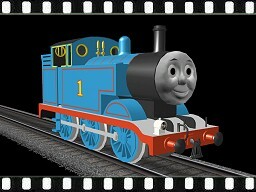 Edward the Blue Engine, #2 (v1.0) Edward is a 4-4-0 tender engine who works on the Island of Sodor. He is a kind engine and is willing to listen to the others. He was the first engine on the Island, being originally from the Furness Railway. 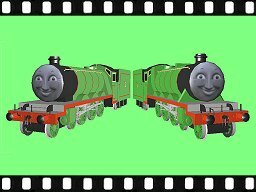 Sounds and cab aliased to default Flying Scotsman model. 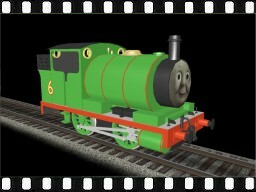 Henry the Green Engine, #3 (v1.0) Henry is a 4-6-0 tender engine who works on the Island of Sodor. He is very mindful of his green paint with red stripes (for which he stuck in the tunnel, afraid the rain would spoil it!). He is larger than James but smaller than Gordon. He was often ill, which was a result of his poor design, and needed special Welsh coal. When he had a nasty accident with the Flying Kipper, the Fat Controller sent him to Crewe for repairs, and he came back literally a different engine. Two models included, pre-Flying Kipper Henry + Henry in his more commonly known "new shape." 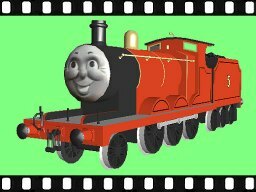 James the Red Engine, #5 (v1.0) James is a 2-6-0 mixed-traffic engine who works on the Island of Sodor. He is proud of his bright red paint and it often gets to his smokebox. He is nonetheless a Really Useful Engine. 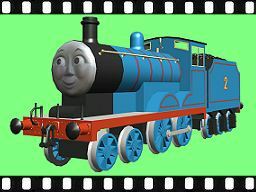 Percy the Small Engine, #6 (v1.0) Includes multiple textures for various facial expressions. Modeled with 3D Canvas 7. Sounds and cab require Flying Scotsman model (not aliased). 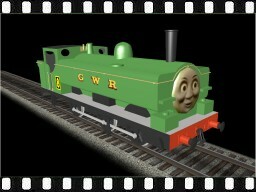 Duck, the Great Western Engine - #8 (v1.0) Modeled with 3D Canvas 7. Red Branchline Coaches v2.0 These branch line coaches are hauled mainly by Duck and Oliver, but they have also been pulled by Edward. 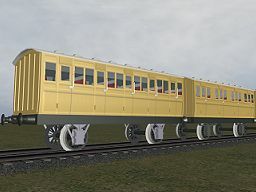 v2 adds windows and interiors, plus an additional 5-door coach and brake coach to compliment the 4-door coach from the original v1 release. .WAG files now have name commands for better identification of cars in your consist building program. 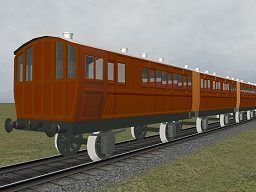 Brake coach features a #5 view. 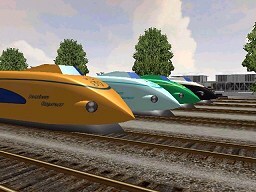 Please note that folder and file names of the new cars differ from v1 (originally released at Train-Sim.com only), and do not directly override the originals. You will need to revise your original consists in order to use these cars. Tan Branchline Coaches v2.0 These are the branch line coaches with which James had his newspaper and bootlace experience. Also the prototype for Annie and Clarabel (4-door version). 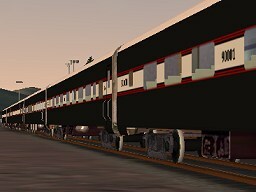 They are commonly seen throughout Seasons 1 and 2.
v2 adds windows and interiors, plus an additional 4-door coach to the set. .WAG files now have name commands for better identification of cars in your consist building program. 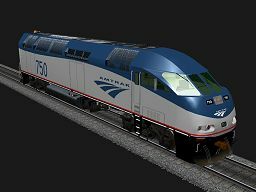 Amtrak Amfleet Control Cab, Phase III v1.0 Download (6.34 MB) Reskin of NALW Amfleet passenger coach into Phase III by Mingo Molina, with FreightAnim cab-car end by KLW TrainSim. Basic cabview with limited animations - based on photo by Jared Forcier - included. Released with express permission and license from North American Locomotive Works. 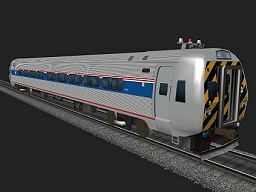 Amtrak Amfleet Control Cab v1.0.1 Download (5.68 MB) Reskin of NALW Amfleet passenger coach by Mingo Molina with FreightAnim cab-car end by KLW TrainSim. Basic cabview with limited animations - based on photo by Jared Forcier - included. 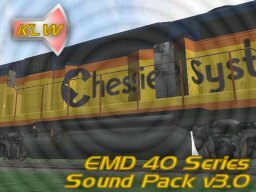 KLW TrainSim's EMD 40 Series Sound v3.0. 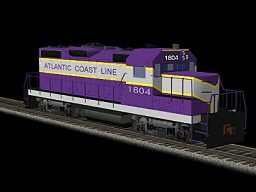 Florida East Coast E9A #1035 Download (1.46 MB) Reskin of 3DTrains' Union Pacific E8A to represent FEC's E9A #1035 in as-delivered scheme. 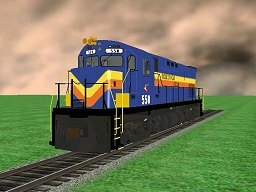 Cab aliased to 3DTrains' E/F cabview, sounds aliased to default GP38. Requires ownership of payware 3DTrains UP E8A #951 for shape file and cabview. 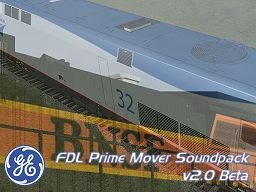 General Electric FDL-series Soundpack v2.0 Beta Download (3.45 MB) A revitalized re-issue of our General Electric FDL prime mover soundpack from 2002, featuring new .SMS files, traction motor and air release sounds courtesy Ron Furto, reworked sounds from our original pack based on recordings from Phil's Locomotive Page, and additional brand-new sounds by Nick O'Dell including a new GE compressor recording. All other sounds are aliased to the default Dash 9 files. 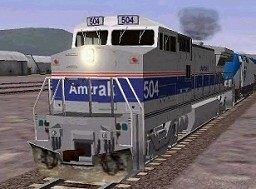 In addition to freight units, the pack also features sounds and .SMS files specifically for the General Electric Genesis-series passenger locomotives. 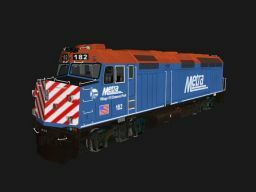 Metra F40PH-2 #182 Download (1.77 MB) Reskin of NALW F40PH model to the blue/red Metra scheme. Includes custom lighting and extra Metra parts added with Freightanim tag. 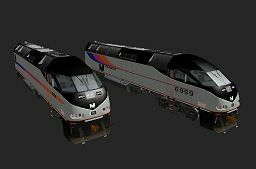 New Jersey Transit Comet II Cab Car Download (5.77 MB) All-new reskin of NALW's Comet II cab car w/freightanim to represent New Jersey Transit's Comet II cab cars. Cab and sounds aliased to the KLW Comet III cab car package. Designed to be used with the KLW NJT Comet series. New Jersey Transit ALP-44 #4415 Download (3.35 MB) New reskin and renumber of the NALW NJT ALP-44 from the NEC Pack #1 into unit #4415. Texture revisions include new logo artwork, body corrigations, numberboards, and side stripes. Model is stand-alone and does not override the original NALW model from the NEC pack. 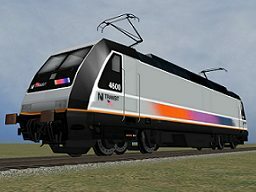 New Jersey Transit ALP-46 #4600 Download (964 KB) All-new reskin of Michael "MadMike" Barthel's DB 101 to represent New Jersey Transit's ALP-46 electrics. Numbered #4600, cab/sounds aliased to default Acela. Thanks to Dave Carney for the photos used to create the NJT tri-stripe design. Released with express permission from Michael "MadMike" Barthels. 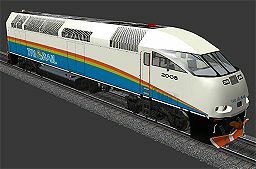 Tri-Rail F40PH #810 & 811 Download (2.43 MB) Reskin of NALW F40PH model to represent pre-rebuild, ex-Amtrak, Tri-Rail F40PH locomotives #810 & #811 in the tri-stripe scheme. Amtrak Phase IV B32-8W Amtrak B32-8W #504 repainted in Phase IV paint, repaint of the KLW BNSF B40-8W #517. Amtrak #750 Fictional Amtrak repaint of KLW Metra MP36PH-3S model. Requires Metra MP36PH-3S set. Download (3.03 MB) Requires Metra MP36PH-3S set. 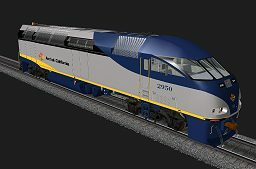 Amtrak California #2950 Fictional Amtrak California repaint of KLW Metra MP36PH-3S model. Requires Metra MP36PH-3S set. Download (2.89 MB) Requires Metra MP36PH-3S set. 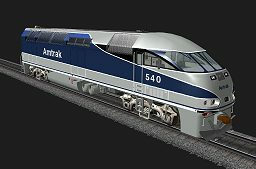 Amtrak Surfliner #540 Fictional Surfliner repaint of KLW Metra MP36PH-3S model. Requires Metra MP36PH-3S set. Download (2.58 MB) Requires Metra MP36PH-3S set. 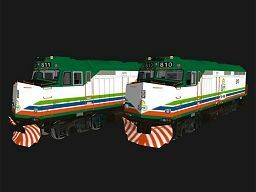 BN EMD GP38-2 Double Pack Two GP38-2 locomotives in BN & BNSF stenciled liveries, repaints of the KLW TrainSim BNSF 2099. BNSF Patched GP60 Set Patched/Repainted units of the original ATSF GP60 from KLW. The following road numbers are included, 8700, 8721, and 8723. Each has it's own unique weathering detail, and it's own colorized patch. 8700 has chipped painting on the blue, while the other two are dirty from dirt and exhuast. 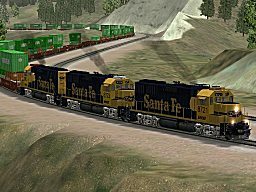 Please read the original readme from the ATSF GP60, which is included in this package, for credit on the original model itself. You will need the same requirements as the ATSF unit required. 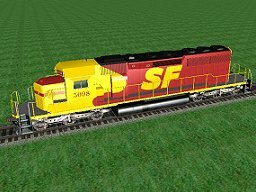 Download (10.8 MB) Based on the AT&SF GP60 model. Full Bucket Line RS1 #13 MSTS Alco RS1 in old "Full Bucket Line" livery. Original model by KLW. .Eng file by Bob Boudoin. .Eng editing and lighting by Paul Fowler. Original line textures by Jacques Belanger. Updated to RS-1 v2.0 shape. GO Transit #602 GO Transit repaint of KLW Metra MP36PH-3S model. Requires Metra MP36PH-3S set. Download (3.37 MB) Requires Metra MP36PH-3S set. 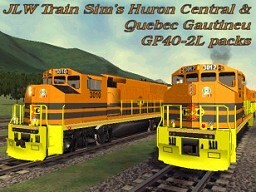 Huron Central/ Quebec Gautineau GP40-2L 4 & 2 packs Huron Central GP40-2L package includes four locomotives in GWI scheme, seperate Quebec Gautineau package includes two. Requires special cab package (available on the site) and MSTS v1.2 update. All GP40-2Ls require the sound and cab packs on the JLW site. MP40PH-3C .SMS files New .SMS files made for use with Matt Florack/MCLW's EMD 710 sounds + the default KLW MP36 sounds. Ron Furto-based SMS files. Download (8.09 kB) For use with GO Transit #602, some file editing necessary. MARC MP36 2-pack, #11 & #12 MARC repaint of KLW Metra MP36PH-3S model - two repaints included; MARC #11 & MARC #12. Requires Metra MP36PH-3S set. Download (6.06 MB) Requires Metra MP36PH-3S set. Metrolink #889 Metrolink repaint of KLW Metra MP36PH-3S model. Requires Metra MP36PH-3S set. Download (2.68 MB) Requires Metra MP36PH-3S set. Metro North GP40FH-2/FH-2M two-pack Metro North repaint of Kurt's FH-2 model. These monsters are very rare engines. Only 16 now operate in the world. MSTS Bin update is needed. 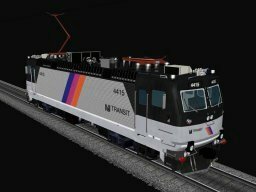 Kurt's NJT GP40FH-2 Model is needed. Download (4.68 MB) Features units #4185 and rebuilt #4900. Shape file is identical to NJ Transit unit. Metro North GP40-2 #4190 Metro North repaint of Kurt's GP40-2 model. The ONLY of its kind in the world. 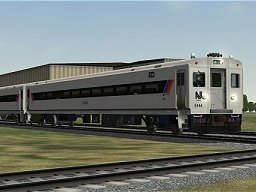 Requires MSTS Bin, MSTS v1.2, and the KLW NJT GP40FH-2. Metro North GP40FH-2 #4907 Metro North repaint of KLW NJT #4100 model. Requires NJT GP40PH-2 set. 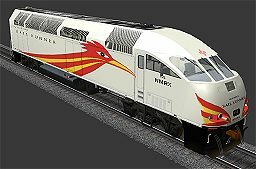 New Mexico Rail Runner #102 New Mexico Rail Runner repaint of KLW Metra MP36PH-3S model. Requires Metra MP36PH-3S set. Download (3.60 MB) Requires Metra MP36PH-3S set. 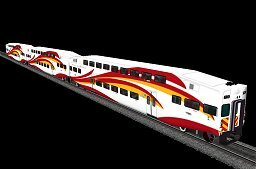 New Mexico Rail Runner Bombardier Cars New Mexico Rail Runner Bombardier cab/coach set. Based on GO Transit Beta v0.1 Pack. 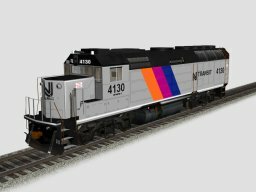 NJ Transit GP40FH-2 #4130 Repaint of Kurt's #4133 to #4130, with darker stripes and darker gray body. Requires KLW NJT GP40FH-2 addon and respective required addons for the original FH-2. NJ Transit GP40-2 #4300 NJT repaint of Kurt's GP40-2 model. We have 4 of these units 4300-4303, we use them to rescue disabled trains, and on ballast. Requires KLW 40 Series Sounds v3.0 & KLW NJT GP40FH-2 addons. 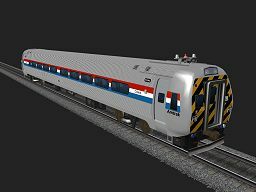 NJ Transit MP36 2-pack Fictional New Jersey Transit repaint 2-pack of the KLW Metra MP36PH-3S model. Two schemes included. Requires Metra MP36PH-3S set. Download (6.67 MB) Requires Metra MP36PH-3S set. North Carolina D.O.T. MP36 #1960 Fictional NCDOT repaint of the KLW Metra MP36PH-3S model. Requires Metra MP36PH-3S set. Download (3.35 MB) Requires Metra MP36PH-3S set. Thomasville Railroad RS1 #60 MSTS Thomasville Railroad RS1 #60 in the Thomasville Railroad early (1941) paint scheme. Based on the RS1 reskin pack. Sounds and cabview aliased to GP38. Thomasville Railroad RS1 #62 MSTS Thomasville Railroad RS1 #62 in the Thomasville Railroad early (1941) paint scheme. Based on the RS1 reskin pack. Sounds and cabview aliased to GP38. Tri-Rail #2008 Fictional Tri-Rail repaint of KLW Metra MP36PH-3S model. Requires Metra MP36PH-3S set. Download (3.02 MB) Requires Metra MP36PH-3S set. 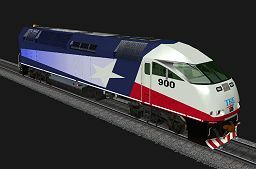 Trinity Railway Express #900 Fictional TRE repaint of KLW Metra MP36PH-3S model. Requires Metra MP36PH-3S set. Download (3.30 MB) Requires Metra MP36PH-3S set. 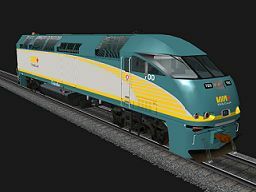 Via Rail #700 Fictional VIA Rail repaint of KLW Metra MP36PH-3S model. Requires Metra MP36PH-3S set. Download (3.16 MB) Requires Metra MP36PH-3S set. 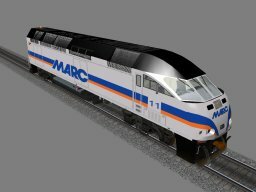 VRE RP39-2C V02 An attempt to model one of Washington D.C.s commuter transit lines VRE. This skin is one of the 10 original RP39-2C/ GP40 locomotives rebuilt by MK in the early 90's which started its life as SAL 642 from 1967. 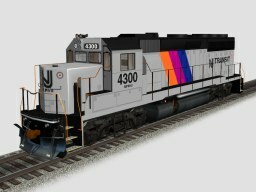 Modeled on KLW's NJT GP40-2 #4300. Conrail GP40-2 #3279 v1.0 Repaint of the Conrail/NS spec. 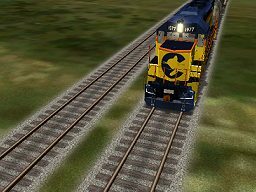 KLW GP40-2 model, into Conrail #3279. 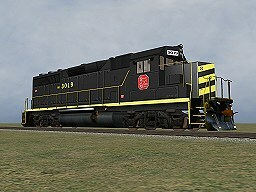 All-new GP40-2 reskin with accurate textures & detailing. Features KLW cab and sounds. Copper Basin GP38-2 #302 v1.0 Second in a series of Copper Basin Railway Locomotives, this time utilizing the updated GP38-2 of KLW. Although not entirely prtotypical as some nose detail is missing, this is a fair representation of the real loco. Cab and sounds aliased to default GP38-2. EJ&E GP38-2 #703 v1.0 Repaint of the new KLW BNSF GP38-2 #2099 v1.4, into Elgin, Joliet and Eastern GP38-2 #703. All-new GP38-2 reskin with accurate textures & detailing. Cab and sounds are aliased to the default GP38-2. EJ&E #703 includes Bob Bourdin's v4.7 physics, and GP38-2 coupling data v1.4 from Jim Ward. Full Bucket Line GP38-2 #1602 v1.0 Repaint of the KLW BNSF GP38-2 v1.4 model into fictional Full Bucket Line #1602. 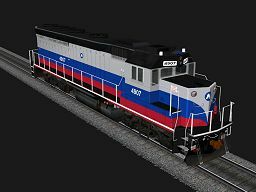 All-new GP38-2 reskin with accurate textures & detailing. HLCX GP40-2 #4405 v0.1 Repaint of the KLW NS GP40-2 #3043 into HLCX #4405, a lease unit once used in Amtrak service. Features accurate textures & weathering. Includes Bob Bourdin's v4.7 physics. 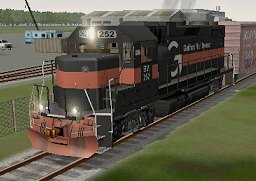 Cab aliased to default SD40-2 from MSTS v1.2. Sounds aliased to KLW's 40 Series Sound v3.0. HLCX SD40-2 #6060 v0.1 Repaint of the MSTS v1.2 SD40-2 into HLCX #6060. Features accurate textures, realistic weathering and Bob Bourdin's v4.7 physics. 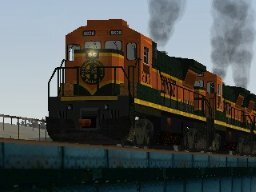 Cab aliased to default SD40-2 from MSTS v1.2. Sounds aliased to the default GP38-2. 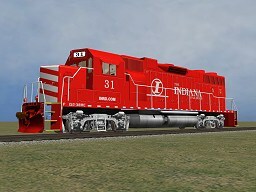 Indiana Railroad GP38-2 #31 Repaint of the KLW BNSF GP38-2 v1.4 model into Indiana Railroad #31. 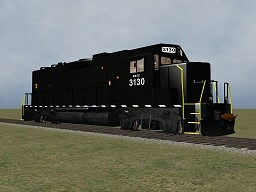 Indiana Railroad GP38-2 #3130 Repaint of the Conrail/NS spec. 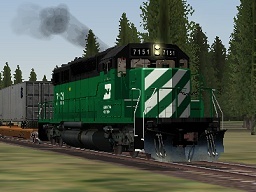 KLW GP40-2 model, into Conrail #3279. 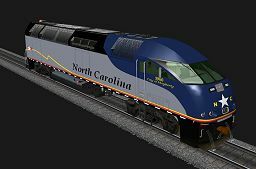 All-new GP40-2 reskin with accurate textures & detailing. KCS GP40-2 #3019 Repaint of the Conrail/NS spec. 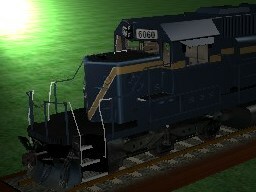 KLW GP40-2 model into KCS #3019, all-black variant. Utilizes updated NS #3034 shape file. New Brunswick Southern GP38-2 #9801 v1.0 Originally built as Southern Pacific 7777, renumbered to 6674, the unit was retired by SP in 1995. Sold to Progress Rail, the loco was refurbished at CLN Indusries at Charny Quebec, into a GP38-3. Inspiration for this paint as well as the documentation, was found in the August issue of Diesel Era magazine. New Hampshire Northcoast GP38-2 #3823 v1.0 Repaint of the KLW BNSF GP38-2 v1.4 model into New Hampshire Northcoast GP38-2 #3823. 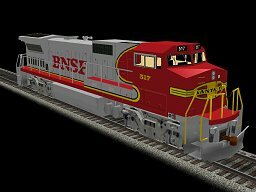 All-new GP38-2 reskin with accurate textures & detailing. Ontario Northland GP38-2 #1802 Repaint of the MSTS v1.2 SD40-2 into ONR's new Millenium scheme. Unit #1802. Features accurate textures, authentic detailing, and Bob Bourdin's v4.7 physics. Ontario Northland GP38-2 #1804 Repaint of the MSTS v1.2 SD40-2 into ONR #1804 (pre-2000 scheme). Features accurate textures, authentic detailing, and Bob Bourdin's v4.7 physics. Rock And Rail GP40-2 #201 v1.0 Repaint of the KLW GP40-2 model into Rock And Rail GP40-2 #201. Rock and Rail is a private quarry road in Colorado. This unit was recently aquired to replace the GP7 that had the original designation of #201. 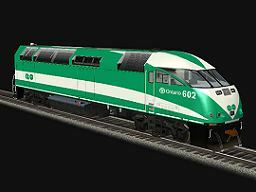 BN Executive Passenger Car Set v1.0 The Burlington Northern Executive Passenger Car Set includes seven BN Executive reskins of Gaetan Belanger's Via Rail passenger cars. The set represents what might have been if BN continued to run passenger service into the 1990's. 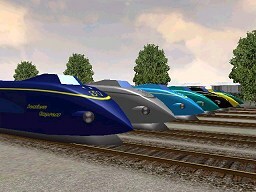 They also closely resemble as the actual business car prototype units used by Burlington Northern. GEC Alsthom SD40-2 #6054 v1.0 Repaint of the MSTS v1.2 SD40-2 into GEC Alsthom #6054. Features accurate house/demo colors, authentic detailing, and Bob Bourdin's v4.7 physics. Guilford Rail Systems #252 Repaint of the new KLW BNSF GP38-2 #2099 v1.4, into Guilford Rail Systems GP38-2 #252 by Mike Worden. 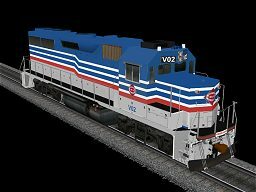 Includes all-new GP38-2 reskin with high-detail textures. Cab and sounds are aliased to the default GP38-2. Guilford #252 includes Bob Bourdin's v4.7 physics, and GP38-2 coupling data v1.4 from Jim Ward. Locomotive Leasing Parntners #2341 Repaint of the KLW BNSF GP38-2 #2099 v1.4, into ex-UP Locomotive Leasing Partners GP38-2 #2341. 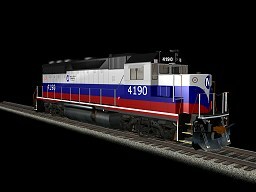 Includes all-new GP38-2 reskin by Mike Worden, with high-detail textures and realistic wethering. Cab and sounds are aliased to the default GP38-2. 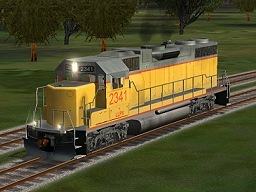 LLPX #2341 includes Bob Bourdin's v4.7 physics, and GP38-2 coupling data v1.4 from Jim Ward. 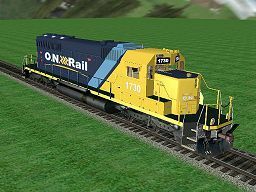 Ontario Northland SD40-2 #1730 Repaint of the MSTS v1.2 SD40-2 into ONR's new Millenium scheme. Unit #1730. Features accurate textures, authentic detailing, and Bob Bourdin's v4.7 physics. Matching ON GP38-2 model available in KLW Members' sections. 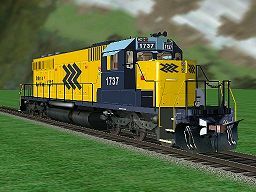 Ontario Northland SD40-2 #1737 Repaint of the MSTS v1.2 SD40-2 into ONR #1737 (pre-2000 scheme). 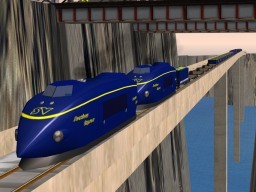 Features accurate textures, authentic detailing, and Bob Bourdin's v4.7 physics. Sea View Speedster #800 v2.0 This package includes a SeaView 'Warbonnet' reskin of Mark Toland's Santa Fe Speedster. Requires that you have Mark Toland's speedster.zip and spdcab.zip installed. 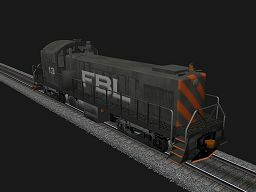 These files are available at Train-Sim.com. 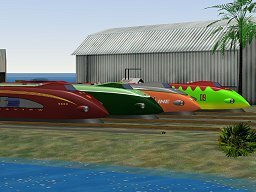 Download (1.48 MB) Version 2 is NOT compatible with SeaView Speedster v1 at Train-Sim.com. We recommend that you remove v1 before installing v2. Seminole Gulf Railway C425 #550 v1.0 Repaint of Jan Henning Gettkant's C425 into Seminole Gulf uni #550. Features current Seminole Gulf paint scheme, and Bob Bourdin's physics. Sounds aliased to default GP38-2. Cab included from Jan Henning Gettkant's EL unit. 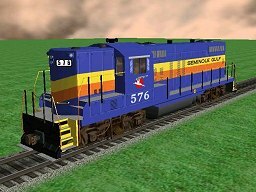 Seminole Gulf Railway #576 v1.0 Repaint of 3DTrains' GP9 v1.0 into Seminole Gulf GP9 #576. Features authentic PH1 Seminole Gulf paint scheme, and Bob Bourdin's physics. SPSF SD40-2 #5098 v1.0 Repaint of the MSTS v1.2 SD40-2 into SPSF #5098. 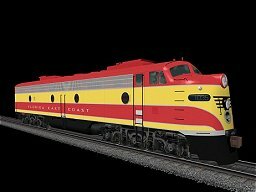 Features accurate merger Warbonnet colors, authentic detailing, and Bob Bourdin's v4.7 physics. Also includes AI version. Custom cab by Jean-Louis Chauvin included, sounds aliased to default GP38-2. NOTE: These addons are considerably dated, and will not nessesarly be perfectly accurate or faithful examples of the prototype. Use only if you feel you cannot live without them. 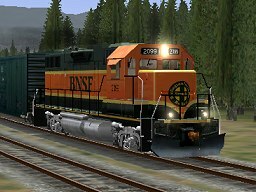 BNSF B40-8 #8608 (v2.0.1) Download (4.02 MB) Sounds aliased to default Dash 9. Cabview from original v2.0.1 release included. Do not install if you have earlier v2.0 release from 6/13/02 - will override original's .SMS files, rendering original P5 horn inoperable. 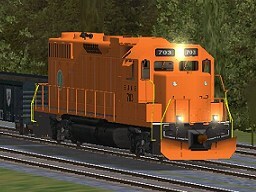 BNSF B40-8W #517 (v1.1.1) Download (816 KB) Sounds and cab aliased to default Dash 9. Do not install if you have earlier v1.1 release from 2002 - will override original's .SMS and .CVF files. 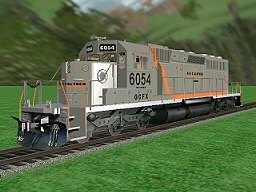 BNSF B40-8 Blank Reskinning Templates Download (182 KB) Blank templates for #8608. Re-release 8/26/08. 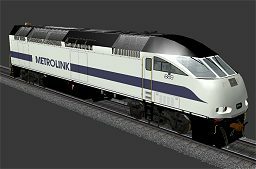 BNSF B40-8W Blank Reskinning Templates Download (175 KB) Blank templates for #517. Re-release 8/26/08. Gold Coast Railroad Museum GP9u #1804 Download (572 KB) Reskin and mild modification of David Dandy's GP9 Alpha Demonstrator & TSM .DST files to represent the Gold Coast Railroad Museum's ex-Alaska Railroad GP9u #1804. Previously released (privately) in January 2003. First public release. 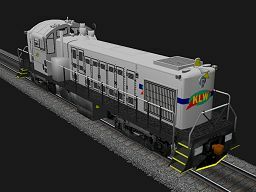 KLW RS-1 Reskinning Kit v2.0 Download (894 KB) Re-release 8/26/08.